People Merak-Sakteng, shared on how happy they are to have the Minister of Work and Human Settlement, Lyonpo Dorji Tshering – represent them. They said that, until now they did not have any representative from their community reaching the level of Dasho (holding kabney and patang) or Lyonpo. 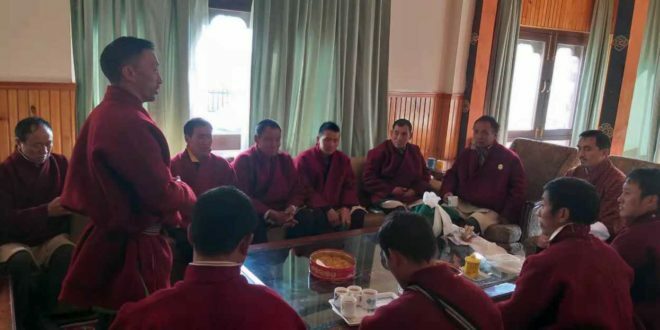 Thereby, before the 2018 elections they insisted that Dorji Tshering should take part in the electoral process to represent them in the parliament. And fortunately, as they wished, their candidate not only got elected but became one of the Ministers. They said that, until now they felt that they were disconnected from other Dzongkhags because of their remoteness and culture but now this feeling has changed. Now that, they have a Lyonpo from their constituency, they are hoping and expecting for better development.During a Dhar offering ceremony, more than 40 people from the constituency came all the way to Thimphu to show their respect and express their happiness. “All the developed places must have gone through the same situation with road connectivity and infrastructure development”, he said, adding that, the remoteness of gewogs depends upon distance and there are many around the country. 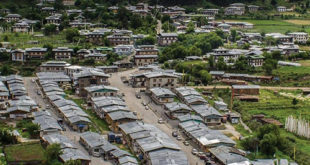 Among them is his constituency, Radhi-Sakteng which is far from the Trashigang town, he said.He pointed out that areas in town and cities develop faster than remote areas though his constituency is in the process of development. Lyonpo,on other hand, said culture is what mattersadding that, culturally, the way they dress and talk is different from others which is why people from Merak and Sakteng are considered a bit different from others. Lyonpo said that, ever since the democracy has started, there was no representative from their community. He said that, 20 to 30 percentage of people from his constituency might be satisfied with his victory as he was actually their choice. “They said that, me getting elected is more than enough and to do what I can do in next five years. I don’t think they will have any bigger expectations from me”, he added. However, he said that, for the larger group, he will do his best to live up to their expectations and he will work hard in the next five years collectively with the people. “I will feel sorry if I fail somewhere or somehow in my tenure. But I will work with the hope to fulfill all expectations”, he added. He shared that, being Minister, he needs to look nationwide and so roads and bridge are always the first priority in the Ministry as they are the main foundationto carry out economic activities in the country. “Our aim is to make the roads pliable throughout the year, be it highways or be it a farm roads in next five years and we will work hard for it”, Lyonpo added. Particularly in his constituency, he said that, he will work towards reaching up the road in all the four gewogs in his constituency. “Though some gewogs already has road connectivity, we are yet to blacktop and make it pliable throughout and we will do that soon”, he said. In addition, Lyonpo also said that, water shortage and irrigation channel has been always an issue though Phongmed and Radhi is a good place for rice cultivation. “They are identified as rice bowl, however due to water shortage and irrigation issue, the farmers lost interest in rice cultivation”, he said. Therefore, he would look forward in addressing those issues and, if possible, they have a plan to construct a small hydropower project in the constituency. Sangay Dorji, Sakteng Gup said that, in the old days they did not have any representativeat this level because there were not many whowere highly qualified. But with time their community has more of qualified people with better work experienced which is why they now have the representative. “We are very much happy with the win”, he said. He said it is true that Lyonpo needs to look after the country as a whole. However, he said, “Lyonpo knowswell about the community and therefore we have a hope that Lyonpo would look upon the community for better development, mainly in terms of road connectivity”. Likewise, Radhi Gup, Kulung said that, knowing the importance of having representative form the community, people were supportive and this ended in a positive resultand people celebrated the victory. 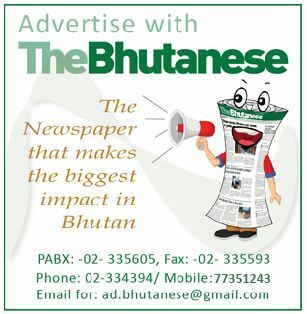 He said that, with time there are developmental activities taking place in the gewog but a lot more need to be done. “We have road connectivity but that needs base course and blacktopping and we hope they would priorities for additional development”, he added. 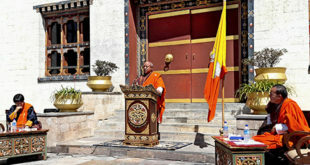 He also said that, now that they have a representative from their constituency, theywant to also focus on preservation of culture and lhakhang in the community. Tashi Tobgay, 30-year-old from Sakteng is one among those people who came to Thimphu to offer Lyonpo a Dhar. He said, this is unusual and the first time where people went in a large group just to wish Lyonpo good luck. “We never had such chance in the past and therefore we were extraordinarily excited this time. In 10 years’ time, we had representative from Radhi but none from Sakteng because we were very less in number”, he added. He said that, to show their gratitude and happiness they decided to visit Lyonpo in their local dress so to represent not only themselves but the constituency as a whole. From Sakteng, they had to halt two nights to reach Thimphu but he said they did not mind at all because that was nothing when compared towhat Lyonpo has sacrificed on their request. He said that, they have no individual expectations from Lyonpo. “There are chances of division within the community. So we would want Lyonpo to look upon the matter and keep the community united and do everything with equity”, he added. Another, Pema Wangdi, 35-year-old from Merak who visited Lyonpo said that, the 2018 election is different because until now the people of Merak-Sakteng were just considered as highlanders. “Now that we have a representative, I will support him until the end as he sacrificed a lot to serve his community, people and country”, he added. The two previous government did their best for better development, he said, adding that, they would hope better from this government as well. “Merak and Sakteng gewog had been left behind in terms of road connectivity. Now that Lyonpo knows better and being from the relevant ministry, we hope and expect that the two gewogs would be made like other 13 gewogs under Trashigang Dzongkhag”, he added.